Around 500 women staged a noisy protest Saturday in the German city of Cologne against a shocking rash of sexual violence during New Year's festivities that was blamed on migrants. Carrying signs bearing slogans like "No violence against women" and "No means no! It's the law! Stay off of us! ", the women banged pots and blew whistles as they rallied outside Cologne's famed Gothic cathedral. 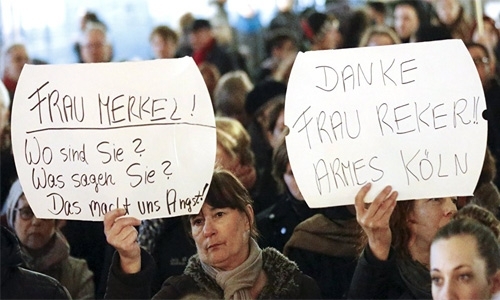 Others waved banners saying "Protect our women and children", as outrage grew in Germany over the spate of assaults. Cologne police have recorded some 200 complaints, ranging from groping to two reported rapes during New Year's festivities. Witnesses have said the assaults were perpetrated by men of "North African or Arab" appearance, inflaming a debate over Germany's ability to integrate about 1.1 million asylum seekers who arrived in 2015. German federal police have so far identified 32 suspects, 22 of whom are asylum seekers, in connection with 76 offences, 12 of which had a sexual nature, the interior ministry said. "We want our safety back. We are against all violence against women," said protest organiser Martina Schumeckers, 57, a musician. "I am standing here for all mothers, daughters, granddaughters, grandmothers, for them all to be able to move around safely especially in our Cologne," she told AFP.